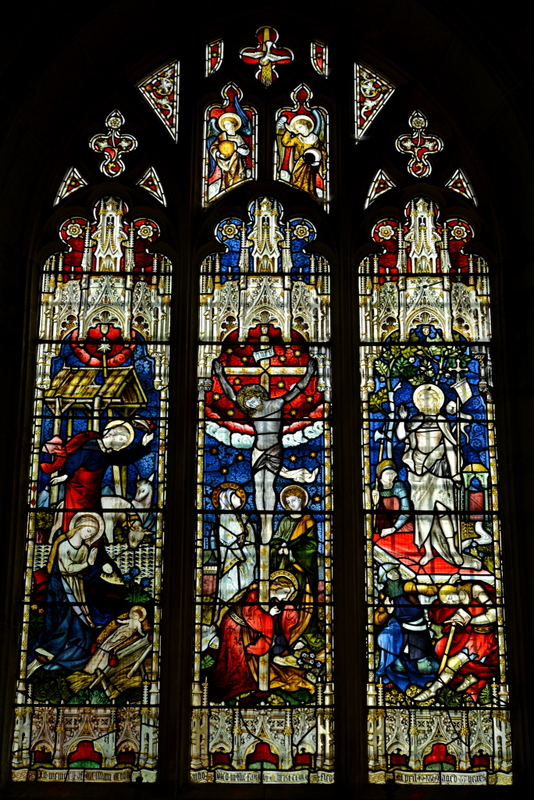 The history of the church is portrayed in the east window of the chancel – namely, the birth, death and resurrection of Jesus Christ without which events no church would have been built. Secure in its entry in the Domesday Book of 1086 it already had a lengthy history. Queen Ediva gave her manor of Peckham to the monks of Canterbury in 961 having inherited it as an infant from her father who died in battle in 902. As her father held a high military office and was recorded as a ‘faithful friend ‘of King Alfred, a Christian king, an earlier church on this manor is surmised. Both the architect and building stone appraisers agree that there is evidence of an early twelfth century building on the exterior north wall of the chancel. It suggests that this was the east end of the early church. The later twelfth century Norman window can also be seen internally, high in the north east wall of the chancel. A full scale restoration was undertaken in 1857 a process which took place over eleven years. The church had faced the problem of enlarged congregations due to the increased population mainly housed in the lower areas of the village. The Churchwardens had anticipated removing the church building, stone by stone, to a more central area in the valley but the plan was abandoned in favour of building Holy Trinity Church in 1840 and St Michaels became a separate parish. Affluent parishioners restored exact reproduction of original features and provided the new substantial pews to be seen today. But in the years leading to 1972 it became obvious that it was not possible to financially maintain the two churches and that as Holy Trinity was better situated to fulfil the needs of a parish church it was decided to make St Michaels Church redundant. On October 1st 1972 after a harvest festival occasion, the door of St Michael’s Church was closed and passed to the care of Redundant Churches and later to the more positive Churches Conservation Trust. The church remains a consecrated place and the Roman Catholic Church, the Methodist Church and Salvation Army are able to make arrangements for its occasional use. 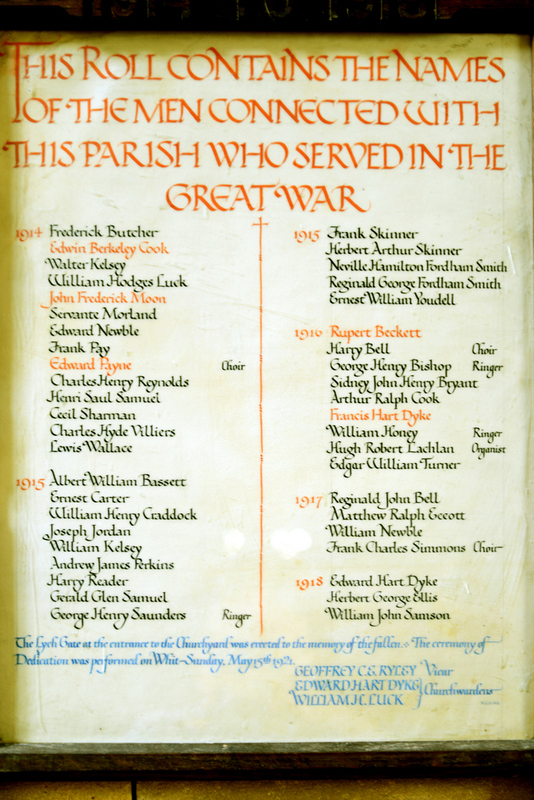 The Lych Gate is a monument erected in 1921 by the people of the parish in memory of the men from the parish who died in WW1.Those who died in WW2 were included subsequently. CWWG memorial to J Hammond – His parents of West Malling wished him to be buried at St Michaels as he was born and bred in East Peckham. 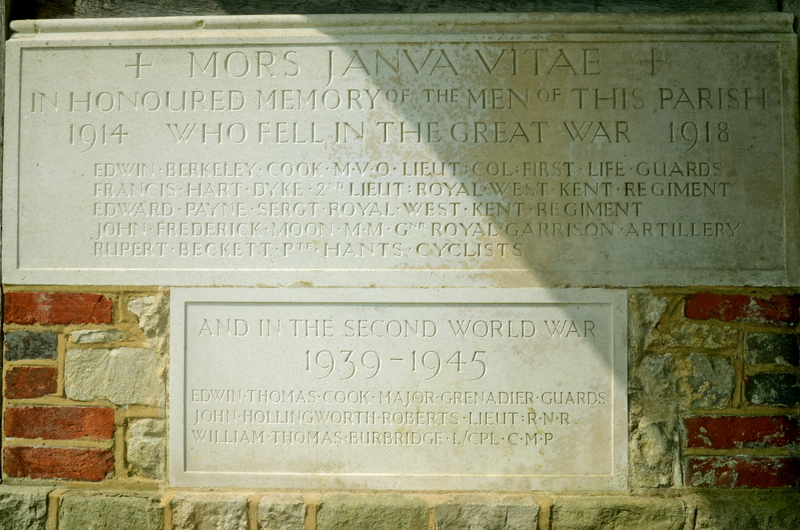 He is named on the West Malling memorial. CWWC memorial to Rupert Becket, named also on war memorial. Correction - he was of the Huntingdon Cyclists. 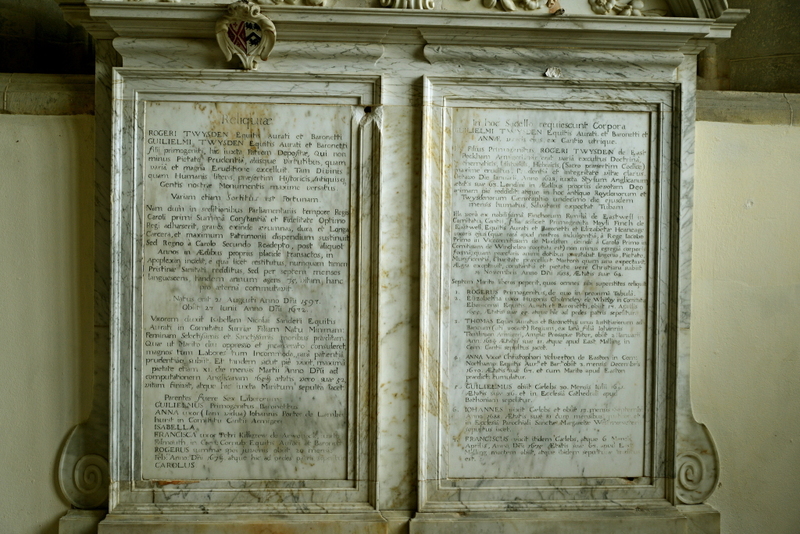 Many monuments to the Twysden family of Roydon Hall in the parish, notably of Sir Roger famous for his diary written during his imprisonment in the Civil War. Also of the Whetenhall family who suffered stigma for their allegiance to the Roman Catholic faith. To the Cook family of Roydon Hall from1835.